How good is your grammar? Find out with my simple test! Which British prime minister led both a majority Conservative government and a multi-party coalition, having previously served as a minister under two Conservative and two Liberal prime ministers? How many times as large as the distance from the Earth to the moon is the distance between the innermost and the outermost of Saturn’s rings? If you could see tourists posing to be photographed, leaning slightly to the side and theatrically straining to hold up thin air, what landmark would you see behind them? Of all the countries that border Russia but are not members of the European Union, which has the smallest population? I don’t care whether you know the answers. But if you understand the questions, you have at least a pretty good practical grasp of English grammar (and vocabulary). Most grammar tests aren’t like mine. They usually focus on the theory, or on the finer points of the test-setter’s preferred version of standard formal written English. The theory is fine, but to obsess with it is to miss the wood for the trees. If you learned English as your first language, you absorbed almost all of its grammar with little explicit instruction. Immersed in the language, your insatiable infant brain figured out the functions of nouns, verbs, adjectives and so on without needing to have those terms defined. Indeed, you wouldn’t be able to understand definitions of them without already knowing the language well enough to know how they work. Language is essentially a skill; to treat it as a body of facts is possible but secondary. You can know it without knowing about it. But knowing about it is good too. The theory can be helpful for seeing how to finesse sentences that don’t feel quite right, for learning a second language (or appreciating different dialects of English), and for teaching language (or explaining edits). Finding out about how grammar works can help to strengthen the grasp of language that you already implicitly have – as long as it’s taught well. If taught badly, it can undermine your faith in that mostly sound intuitive grasp. One of the best aspects of Garner’s Modern American Usage is that Bryan Garner doesn’t simply judge things as right or wrong. He doesn’t shy away from condemnation, but he knows – like any genuine language aficionado – that English is always in flux and always contains grey areas. Rejected. “A new form emerges as an innovation (or some dialectal usage persists) among a small minority of the language community, perhaps displacing a traditional usage. … People normally consider innovations at this stage outright mistakes.” Examples: “unconscionably” to mean “unconsciously”; “thiefs”; “prevaricate” to mean “procrastinate”; “highjack” instead of “hijack”; “baited breath”; “brung”. Widely shunned. “The form spreads to a significant portion of the language community, but it remains unacceptable in standard usage. … Terms in stage 2 often get recorded in dictionaries as variant forms”. Examples: “simplistic” to mean “simple”; “principle” to mean “principal”; “pour over” to mean “pore over”; “fall between the cracks” instead of “fall through the cracks”; “weeped”; “between you and I”; singular “criteria”. Widespread but… “The form becomes commonplace even among many well-educated people, but it’s still avoided in careful usage.” Examples: “in regards to” instead of “in regard to”; “miniscule” instead of “minuscule”; “infer” to mean “imply”; “fortuitous” to mean “fortunate”; “flaunt” to mean “flout”. Ubiquitous but… “The form becomes virtually universal but is opposed on cogent grounds by a few linguistic stalwarts.” Examples: “regretfully” to mean “regrettably”; “fulsome” to mean “lavish”; “disinterested” to mean “uninterested”; superlatives used with two objects (e.g. “the best of the pair”); “anxious” to mean “eager”; “the reason is because”. Fully accepted. “The form is universally adopted except by a few eccentrics.” Examples: “none” with plural verb; “decimate” to mean “cause destruction to”; “under the circumstances” rather than “in the circumstances”; “finalize”; “you can’t have your cake and eat it”; split infinitives where they feel natural. If someone sternly insists that it’s wrong to use a certain word a certain way, many people will be inclined to believe this – even if they themselves use it that way. They vaguely imagine that some definitive set of language rules exists and that they follow maybe three-quarters of these rules – more, if they make a special effort – while the discerning few manage 95%, 99%, even 100%. It might be a bit intimidating or even annoying to be corrected, but it’s good to have someone around with such high standards. Right? There’s just one problem. A person’s standards may be strictly defined, boldly stated and uncompromisingly applied, but that doesn’t mean those standards are high. Standards can be arbitrary and idiosyncratic. And there is no hierarchy of discernment: different people get twitchy about different alleged mistakes. Some people fume about restrictive clauses beginning with “which” but happily split infinitives; for others, it’s the other way round. There’s a big stock of common complaints that these people pick from as they feel their own particular urges. But there are also some much rarer complaints. These are not signs of grandmaster-level perfectionism: they are just quirks, however confidently decreed. The pet peeves that any particular person happens to have are not a reliable guide to good English. For some examples, see Simon Heffer’s recent list of “common mistakes”. He makes some fair points (“acquiesce” means to agree grudgingly, not just to agree; the past tense of “earn” is “earned”, not “earnt”; a “fatwa” is any Islamic clerical judgement, not necessarily a death sentence) and he emits some of the usual howls of pseudo-rationalised outrage against perfectly good standard usages (“between” must not be used with more than two objects; “hopefully” must not be used to mean “let’s hope that”; “transpire” cannot mean “happen”). ABLE Only living beings are able. To say that ‘this key may be able to open the door’ is wrong. A man may be able to open the door using the key, or the key may unlock the door. The only usage guide to even mention this as an issue is Peters, and she notes only a tendency, not a rule: “able to takes animate subjects much more often than inanimate ones”. Indeed, her own usage gives us some inanimate subjects. Elsewhere in the book, she writes that “software is able to identify some of the abstract language”, that free morphemes are “able to stand without any attachments” and that various words are able to do various things. AREA is a word that should have a specific geographical significance, but which has become a catch-all term to refer to a subject or a topic. ‘This used to be a nice area’ illustrates a legitimate usage. ‘Growing roses is an area I know a lot about’ is not. Among the usage guides, only M-W mentions this, noting a few complaints from the 1970s and 1980s about the figurative sense. It says that this usage seems to have taken off mainly after World War II – hence objections to novelty – but that it is now firmly established. But the usage is older: Fowler, listing synonyms for “field” (an equally geographical word with an equally figurative topical meaning), gives without comment the example: “A debate covering a wide area”. The OED doesn’t list Heffer’s hated meaning. But it also says “This entry has not yet been fully updated” and refers readers to its sister, Oxford Dictionaries Online. ODO gives us “A subject or range of activity or interest: the key areas of science”. All the other dictionaries have similar definitions. BATTLE This is an intransitive verb. One does not battle cancer, one battles against it, or possibly with it. The usage guides don’t mention this. The OED dates the transitive verb back to 1399: “Cristes feith is every dai assailed..and batailed.” None of the other dictionaries say that “battle” can only be intransitive. I find nothing to make sense of Heffer’s objection, let along to support it. CURMUDGEON A curmudgeon is not a bloody-minded old man. He is a miser and subject to avarice. That may make him difficult, but bloody-mindedness is not what defines him. The usage guides don’t mention this. The OED – quoting Samuel Johnson – gives only the miser definition. But it also gives the “entry has not yet been fully updated” warning again; following the link to ODO, I find “A bad-tempered or surly person”. Collins and Chambers cover miserliness and surliness, as does M-W – labelling the miser definition “archaic”. AHD doesn’t give the miser definition at all. Clearly, the word’s use expanded to cover not just misers but the ill temper associated with them, and then the miser sense dwindled. I don’t know when this shift happened, but it seems to me that these three examples from the 1890s don’t easily fit the miser definition. To summarise: one statistical tendency, one inexplicable dislike, and two lingering aversions to novelties that are no longer novel – all quixotically reimagined as absolute rules of English. You can call it pedantry if you like; I call it pickiness. Children who dogmatically refuse to eat certain foods are not thereby gourmets. And adults who dogmatically refuse to accept certain meanings of certain words are not thereby linguistic perfectionists. The grammarati insist that “less lorries” should be “fewer lorries”, because “lorries” is a count noun and not a mass noun. Others argue that the less/fewer distinction, despite the best efforts of those who love it, has been widely ignored for centuries and that this is a matter of formal vs informal language, not correct vs incorrect. I have a different objection: the critics are missing the point of the slogan. Do you care how many lorries were involved in the transportation of a toilet roll? Of course you don’t, and Tesco didn’t imagine for a second that you might. The point is that Tesco claims to be reducing the amount of motorised haulage involved – maybe it sources its toilet rolls locally, or has them delivered by bicycle, or packages them more compactly – and thereby reducing its greenhouse emissions (and the traffic on the road). For example: if ten lorries drive ten miles each, that’s greener than having one lorry driving 1000 miles – even though there are more lorries. What matters is the amount of driving. Tesco is using “lorries” as a more concrete, vivid way of saying “haulage” or “transportation”. This is an example of metonymy, like “the pen is mightier than the sword” or “keep your eye on it”. 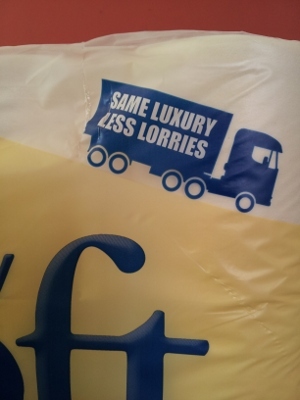 To be honest, I find “less lorries” inelegant; I have many of the same linguistic tastes as the grammarati. But the world is full of inelegant marketing slogans, and this is a tame example to single out for special derision. And in any case, “fewer lorries” would have pushed the reader far more strongly towards a literal interpretation, because the important things that it’s reducing – haulage and thereby pollution and congestion – are all mass-noun concepts.